A dearly-loved film that has captured the imagination of generations, Steven Spielberg's E.T. 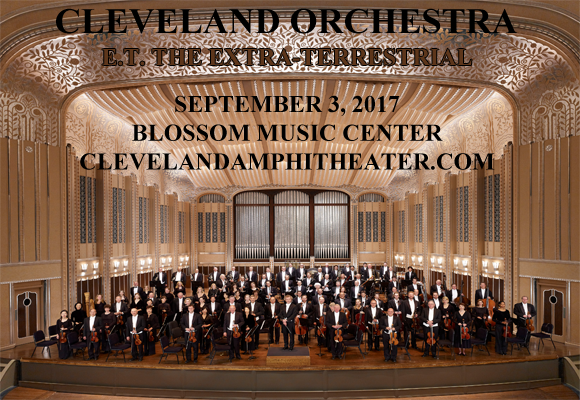 The Extra-Terrestrial comes to Blossom Music Center on Sunday 3rd September 2017! Shown on the big screen, the movie will also be accompanied live, with John Williams' rousing score performed by the unparalleled Cleveland Orchestra, conducted by Brett Mitchell – a magical experience for all the family! Soon celebrating its centenary, Cleveland Orchestra was founded in 1918 by the pianist and impresario Adella Prentiss Hughes, and as of 2017, the incumbent music director is Franz Welser-Möst. The orchestra one of the five orchestras informally referred to as “The Big Five” – the others being New York Philharmonic (1842), Boston Symphony Orchestra (1881), Chicago Symphony Orchestra (1891) and Philadelphia Orchestra (1900). Coined around the time of long-playing records becoming more readily available, the Big Five led the field in "musical excellence, calibre of musicianship, total contract weeks, weekly basic wages, recording guarantees, and paid vacations". That level of professionalism and virtuosity has continued to place Cleveland Orchestra at the top, with Gramophone Magazine ranking the Cleveland Orchestra number 7 on its list of 20 of the world's greatest orchestras in 2012.